An MIT research team has built nanosensors capable of profiling tumors and may help to discover how they will react to certain therapies. The system is designed according to levels of enzymes known as proteases, which cancer cells use to remodel their surroundings. When tailored for humans, this type of sensor could be used to determine the aggressive nature of a tumor and assist doctors to select the best treatment, says Sangeeta Bhatia, the John and Dorothy Wilson Professor of Health Sciences and Technology and Electrical Engineering and Computer Science and a member of MIT’s Koch Institute for Integrative Cancer Research. This approach is exciting because people are developing therapies that are protease-activated. Ideally you’d like to be able to stratify patients based on their protease activity and identify which ones would be good candidates for these therapies. When the nanosensors are injected into the tumor site, and they are activated by a magnetic field that will not harm healthy tissue. Once the sensors interact with and are altered by the target tumor proteins, they are secreted in the urine. They can then be easily detected within an hour. Bhatia and Polina Anikeeva, the Class of 1942 Associate Professor of Materials Science and Engineering, are the senior authors of the paper, which has been published in the Nano Letters journal. The research paper’s lead authors are Koch Institute postdoc Simone Schurle and graduate student Jaideep Dudani. Tumors, particularly aggressive types, frequently have higher protease levels. These enzymes help tumors disperse by cleaving proteins that are made up of the extracellular matrix, which usually surrounds cells and keeps them in place. In 2014, Bhatia and colleagues had used nanoparticles that interact with one type of protease called matrix metalloproteinases (MMPs) to detect cancer. In that study, the team delivered nanoparticles containing peptides, or short protein fragments, meant to be cleaved by the MMPs. If MMPs were there, plenty of cleaved peptides would be excreted in the urine. From the urine it could be detected using a simple paper test similar to a pregnancy test. In the new MIT research, the team was keen to adapt the sensors so that they could determine the traits of tumors in an identified location. To accomplish that, they had to ensure that the sensors were only generating a signal from the target organ, unaltered by background signals that may be occurring in the bloodstream. Initially, they developed sensors that could be activated using light when they made contact with their target. For this they needed to use UV light, but had to ensure it did not penetrate deep into the tissue. We started thinking about what kinds of energy we might use that could penetrate further into the body. To realize this, Bhatia partnered with Anikeeva, who is an expert in using magnetic fields to remotely activate materials. 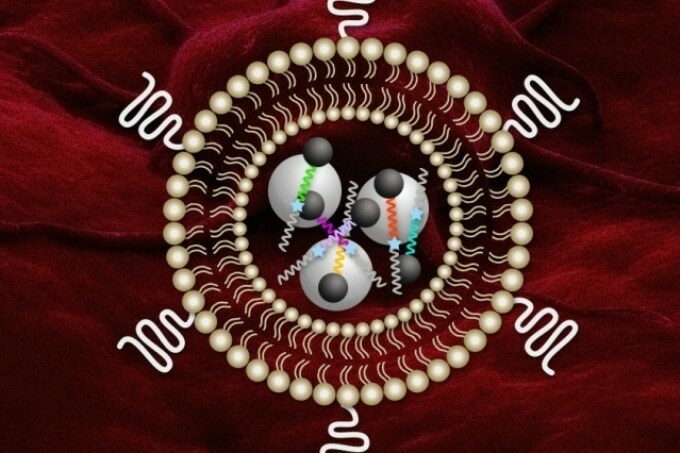 The researchers planned to enclose Bhatia’s protease-sensing nanoparticles together with magnetic particles that heat up when in contact with an alternating magnetic field. The field is created by a small magnetic coil that alters polarity about half million times in one second. The heat-sensitive material that encloses the particles break up as the magnetic particles heat up, allowing the protease sensors to be dispersed. The benefit is that the heat produced by the particles will not damage surrounding tissue. It has been challenging to examine tumor-specific protease activities from patients’ biofluids because these proteases are also present in blood and other organs. The strength of this work is the magnetothermally responsive protease nanosensors with spatiotemporal controllability. With these nanosensors, the MIT researchers could assay protease activities involved more in tumor progression by reducing off-target activation significantly. The researchers conducted some experiments on mice, which revealed that they could use these particles to accurately profile various types of colon tumors based on the amount of protease they produce. Protease-based cancer treatments are currently in clinical trials, and comprise of antibodies that target a tumor protein but have “veils” that stop them from being stimulated before reaching the tumor. The proteases cleave the veils, so this therapy would be highly effective for patients with high protease levels. The MIT team is also studying ways to use this type of sensor to image cancerous lesions that spread from other organs to the liver. If there are fewer than four lesions, it is ideal to surgically remove them; therefore measuring them could help doctors select the best treatment. Bhatia says this type of sensor could even be applied for other tumors as the magnetic field can penetrate deep into the body. This method could also be broadened to perform diagnoses based on detecting other types of enzymes, including those that cut lipids or sugar chains. The research was partially funded by the Ludwig Center for Molecular Oncology, a Koch Institute Support Grant from the National Cancer Institute, and a Core Center Grant from the National Institute of Environmental Health Sciences.